"...the men in this squadron have him to thank for their record in gunnery." "He is one of the Air Force's best aerial gunners, and the men in this squadron have him to thank for their record in gunnery. I have often heard it said that he knows more about the A-4 and A1C-m sights than any other pilot in the Air Force. I know that when I came here I wasn't able to hit the broad side of a barn door in gunnery. But it wasn't long before I had qualified as a sharpshooter. I learned more from the 2 hour lecture that he gave in Clobber College on gunnery than I ever learned at Nellis. But enough of this. I must go on to the club and get on with the party. Let's say hello to John Roberts." 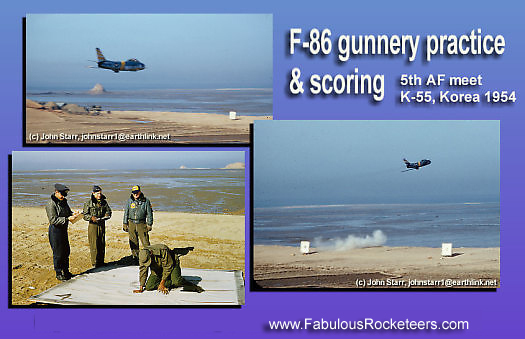 (top slides) "Low angle strafe, 5th AF gunnery meet, K-55, Suwon range, March '54"
(lower slide) "... scoring strafe target. 5th AF meet, Suwon range, March '54"